In some mountainous areas, the construction of the geosynthetic reinforced walls/slopes has to be carried out in constrained or limited space with shorter reinforcements. 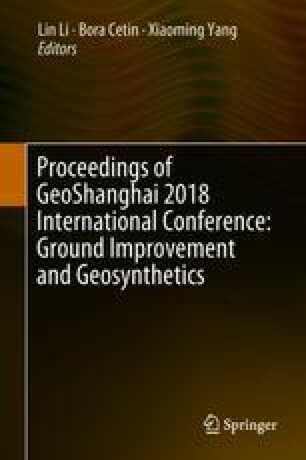 While now the field tests of these “narrowed” geosynthetic reinforced walls/slopes are still lacking, therefore full-scale tests on a high narrowed mechanically stabilized roadbed with wrapped-around geogrid facing of a highway in Hubei Province were conducted. The tests include the measurements of tensile strain in geogrids, vertical earth pressure, horizontal earth pressure, layered settlement and horizontal displacement. The monitoring data showed that the tensile strain distribution around the inside rock-bench was found unusual, namely the stain was higher on top of the rock-bench while relaxing and shrinking around the rock-bench facing. And the vertical earth pressure was much smaller than theoretical earth pressure around the rock-bench facing. The settlement and lateral displacement occurred mostly during construction, and monitored accumulate displacements all met the standards, indicating that the narrowed mechanically stabilized roadbed performed well. The authors are indebted to the Transportation and Communication Department of Hubei Province for its financial supporting for this study (No. 2011-700-3-42). Also, we appreciate the kind help of colleagues of the laboratory and Nete Geosynthetics LTD in full-scale tests. Comments from reviewers and editors to improve the clarity and quality of the paper are welcome and will be appreciated.